While working on the MongoDB Driver for PHP, we sometimes run into problems where we send the wrong data to the server, tripping it up, and not getting the results we want. Drivers talk to MongoDB with a binary protocol, which we refer to as the Wire Protocol. It is a documented binary format, mostly wrapping around BSON structures. Different versions of the MongoDB may respond with varying message formats and likewise prefer (or require) that drivers use newer formats to issue commands and queries. An additional problem is that sometimes mongoS, our query router for sharding, wants instructions in different formats, and sends results back in a slightly different format than mongoD. 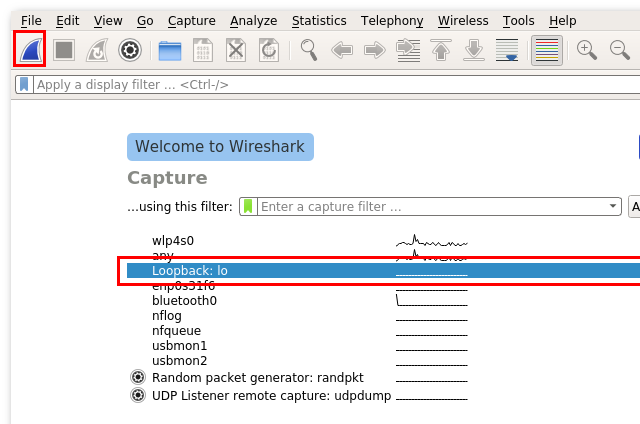 Over the past years, I have been using a network traffic analyser called Wireshark to figure out what actually gets sent over the network connections. This screen lists all the network interfaces that are available on the system, and it allows you to select one (Loopback: lo in my case) and start packet collection by clicking on the shark fin. With Wireshark collecting data, I then connected with the MongoDB shell to the server to see what was sent over a network connection. 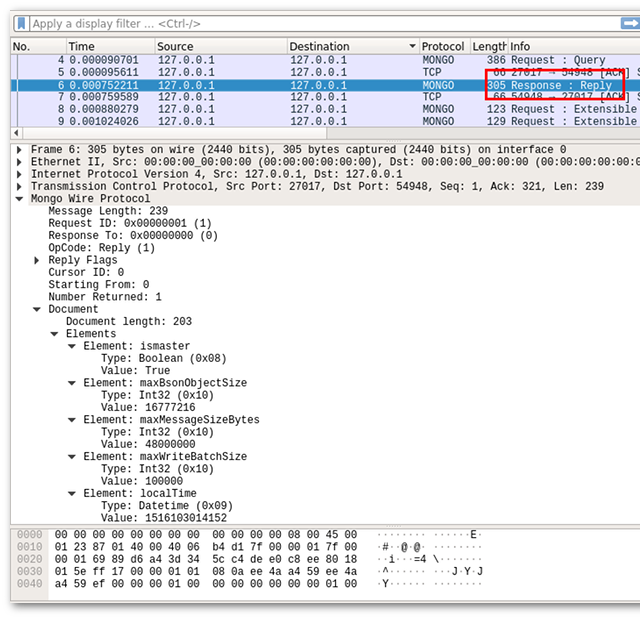 As no network protocol is the same as any other, Wireshark contains lots of different "dissectors" to analyse each specific protocol. There are a lot of dissectors, for nearly every protocol that you can think of—including HTTP, MySQL, NTP, TCP, and of course MongoDB. 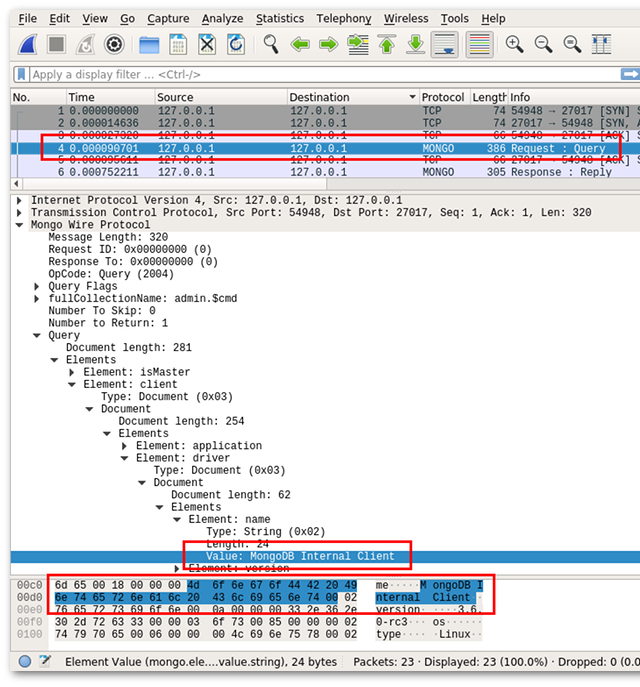 After we connected with the MongoDB shell to the server, we can have a look at what Wireshark collected. In this first screenshot we see that the MongoDB client's first packet is a Request : Query packet. In this first packet it sends an isMaster command to the server to figure out its version, and some other parameters. The dissector has unpacked the BSON Document with length 201 to be able to show us the various elements that make up the request. For example, it sends along which driver is being used to make the request (MongoDB Internal Client) in the client → driver → name element. The result includes parameters such as the maximum size of a data packet (maxMessageSizeBytes), the localTime, as well as the wire version (not pictured). The latter is used to determine which wire protocol versions can understand. So far we have seen two types of packets, Request and Response, but others also exist. In MongoDB 3.6, two extra types of packages are are supported. These are the Extensible Message Format and Compressed packets. The former is replacing all earlier ways of sending queries and commands (and receiving their replies), with a new single packet that can be used in both directions. The latter can be used to compress the data, and this packet also wraps an Extensible Message Format packet. Unfortunately, Wireshark's MongoDB dissector did not support these new packets yet. Instead of waiting for them to be added by the maintainers, I set out to add the missing functionality myself. It is after all closely related to my day job ☺. As I had never contributed to Wireshark, I read up on their development guidelines and quickly found that they have a highly automated way of doing code reviews with rigorous practises in place. This is a welcome difference from most other open source projects to which I've contributed. As I expected, my first patch adding OP_MSG support needed a few revisions before it was merged. 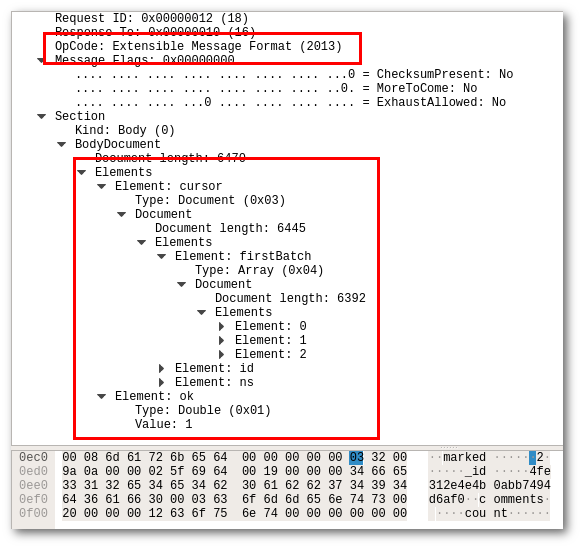 A Extensible Message Format packet consists of one more Sections, which can either be a Body, or a Document Sequence. With a Body being required with zero or more Document Sequence sections following. In this example, all of the Message Flags are empty (unset). In this case the reply contains a cursor description, including its initial batch (firstBatch) of three documents totalling 6392 bytes. Drivers can use these cursor descriptions to iterate over a whole result set. Once there is lot of data to transport, it can be beneficial to compress the data stream. MongoDB 3.4 already included some preliminary work for this, but with MongoDB 3.6 compression is now enabled by default. It can either use the snappy compressor or zlib compressor. Compressed data is send with a different packet type (OP_COMPRESSED) which, as you can probably guess, also was not yet supported. My second patch adds OP_COMPRESSED support to Wireshark. Adding support for zlib was easy, as Wireshark already had helper functions available. Supporting snappy required a bit more manual work. 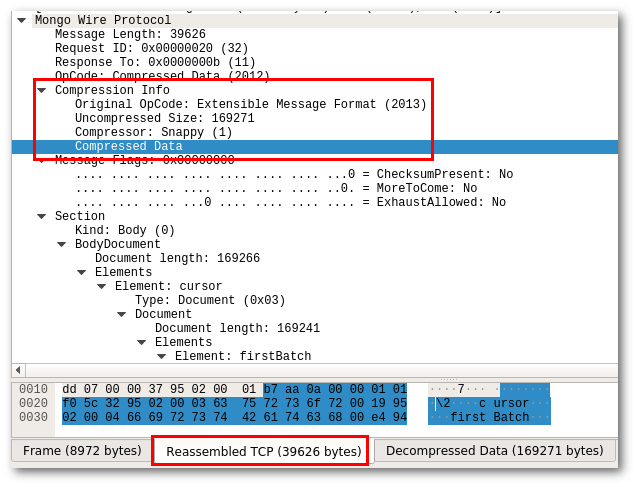 Compressed packets replace the original packet type (OpCode) with one (2012) to denote it is a compressed packet. The header that describes the parameters of the compressed data (Uncompressed Size, and Compressor) also includes the original OpCode that is represented in the compressed data (Original Opcode). When the dissector decompresses a data packet, it adds a new tab containing the Decompressed Data so that you can view the raw bytes of this uncompressed data once you dive into the data structures (e.g. Section, BodyDocument). With support for OP_MSG and OP_COMPRESSED added, figuring out if we send something wrong to a MongoDB 3.6 server becomes a lot easier. Things might still be complicated once we throw SSL into the mix, but that will have to wait until another blog post.